Come for Slots and Disco night at the Empire Casino in Yonkers. Boogie down with your Disco shoes and get ready to dance the night away! Elektrik Company performs the music of Daft Punk! Remember the days when you dance to the wee hours? Dressing your best to get into that one club that matters? People watching and where there is all sorts of things that went on inside this one club that you wouldn't dare tell your mama or even your sister? Well , we are bringing it back to where it started at... STUDiO 54 location 54 Below cabaret club! We are proud to announce we will be performing with the original party club kid and Disco Diva himself , from the Village Voice Michael Musto! With his Glitter gals Tish and Snooky from MANIC PANIC! As a bonus , The Tony Nominated Actress and Broadway extraordinaire Orfeh will do a number with the band! It is definitely not a night to be missed! Get you tickets now!!! Boogie to the Disco Show at DROM in the East Village! 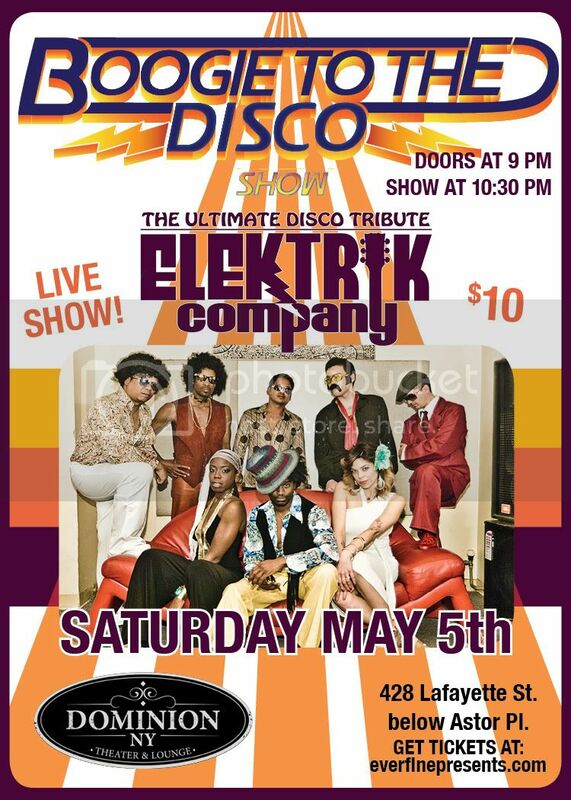 Get your Disco Shoes out for the Elektrik Company in Bayshore Long Island! Boogie down to the Disco comes to Long Island! We're BACK!! We are bringing the Funk and the Boogie to this new Hot spot downtown In NYC! ! It's Cinco De Mayo! Celebrate it with us! Dancing all night! Join our mailing list for the latest news, so you don't miss the Fun!